"Feels like I'm basking in warm sun"
For most, winter spray tans are almost unbearable. When I resolve to have one, you can hear my BLOOD curdling screams from down the hall! With every pass of the spray gun, my entire body tenses and shivers, and I lose it! The cold air, the cold room and the cold tanning solution are too much for this girl to bear. I asked myself, "WHY, WHY, WHY am I doing this? There has got to be a better way!" Recently, I set up a heat lamp in the tanning room. This BRILLIANT 5 head lamp gives off SOOTHING, heat that elevates pleasure and alleviates the torture of a cold airbrush tan. The lights are warm, comforting and feel like the sun! An extra boon to using the lamp is that is emits dry heat it, which "bakes in" the tanning solution color. I have noticed a much faster dry down, with very little rub off . There is also a richer tan development color as a result of using this method! The infrared energy allows the active ingredients in the tanning solutions to penetrate deeper, creating exceptional tan development! This is a great way to turn your clients airbrush tanning experience into a top-notch spa ritual in any season! The key is - the lamps heat up enough to make the client comfortable, but NOT perspire. This ensures nothing interferes with the tanning solutions' development. 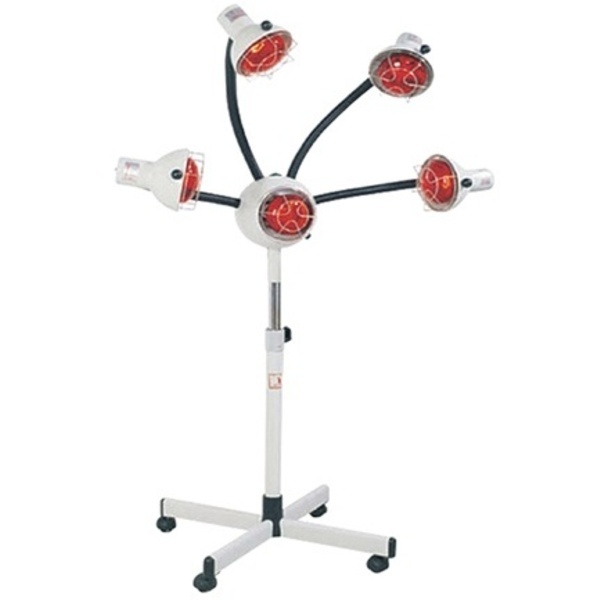 The lamps also offer clients a great way to feel pampered, rather than sticking them in front of a cold fan or even worse, handing them a blow dryer and telling them to dry themselves <--not a very classy option!